The year of 2017 started with good news for the aikido community in the USA. This good news was announced in January during Aikikai’s annual kagami biraki celebration. Four Americans were promoted to 8th dan for the first time in aikido history. Needless to say I know all of them very well so it makes me very happy. One particular person among the four is Mr. Eddie Hagihara from the USAF. I’m especially happy for him for many reasons. The recommendation for his promotion was made by me and the USAF for his exemplary aikido life for many years and his long-time support of the aikido community. That is the congratulations part of this story. Now for the introduction. 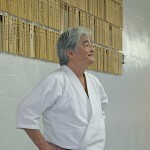 It is unfortunate that Mr. Hagihara is not well-known to the new generation of aikidoists in the USA. The main reason for this is due to the wonderful qualities of his personality. Hagihara Shihan is a very quiet, shy and humble person. (Except when he has a few glasses of beer!) I know these qualities very well because we’ve known each other for 55 years. He was born in 1935 and promoted to shodan in 1962 by the late Koichi Tohei Sensei. Right after he received his shodan he went to study at Aikikai in Japan. I was already an uchi deshi there and that was the first time we met. And we became friends. At that time there were very few foreigners training at Aikikai, not like the present. By the way, Mr. Bob Nadeau, who has also been promoted to 8th dan, was also in Japan for the same reason as Hagihara Shihan. The three of us hung out together on and off the mat because I spoke English. Both Eddie and Bob traveled with me when I went to teach regularly at a US military camp. They were especially helpful when I taught Americans. However, I still wonder whether they were really accompanying me in order to drink the good scotch and beer available in the military camp. Now I must tell you a serious story that shows Eddie’s true nature. By 1962 I had already decided to accept the invitation to be the main teacher at the newly formed New York Aikikai. In contrast to the present, the dojo was very small in membership and most of the students came from judo. Eddie was an original member of the dojo and was the main teacher even thought he had limited knowledge at the time. That’s why he was sent to Japan; to improve his skills and become the main teacher in New York. At that time communications were not as easy and sophisticated as they are today and there was plenty of confusion. Eddie found out about my assignment in New York while he was in Japan and I’m sure he was very surprised and confused about it. The reason I respect Eddie and owe him so much is that his attitude toward me after this confusion was great – he was gracious and humble to me as if nothing bothered him. He gave full support to my goals and efforts at the New York Aikikai. I came to New York in 1964 to be chief instructor and Eddie came back at the same time. I felt bad about the situation but there was nothing I could do but apologize to him. After his return to New York, Eddie got married and opened a dojo on Long Island. He still displays the qualities of quiet strength and humility that are the foundation of his nature and that have made my aikido mission here even easier. I have great respect for him because of that and that’s why I feel so happy about his promotion. He’s still very attached to the New York Aikikai and I think he loves it more than anybody else. My congratulations to Eddie Hagihara and my best wishes for even a longer life in aikido.